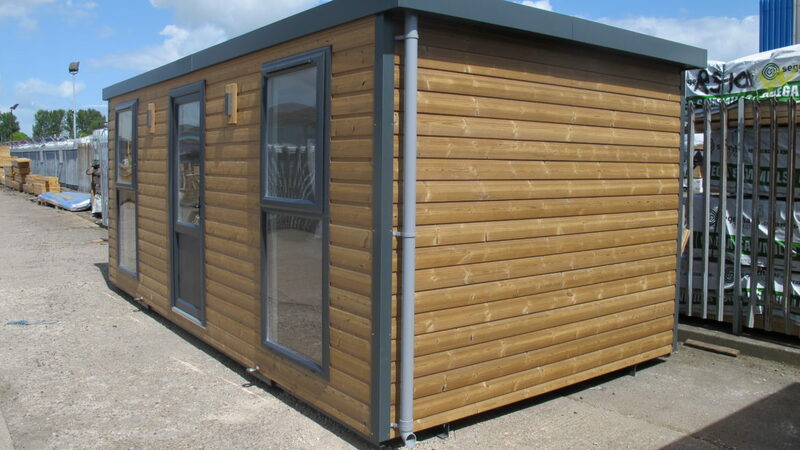 In addition to the mild steel used on our Steel Anti-Vandal cabins, and Plastisol on our Jackleg/Skid-Mounted units, we offer a number of alternative options for external cladding such as the extremely popular timber cladding. The only real reason to choose an alternative cladding is for aesthetic appeal. While most clients are happy with the standard finish of our units, the option to improve the external appearance can sometimes be required in order to appease local residents, achieve planning permission or allow the cabin to sit in an AONB conservation area. Due to the bespoke nature of our industry, there are almost infinite customisation options available, and it can be difficult for potential clients to understand the differences. Here we’ll discuss the most common options available along with their pros and cons. Thermowood is a timber cladding option produced by heat-treating softwood in extreme temperatures. It’s cheaper than hardwood alternatives and also weathers a lot more slowly, requiring far less maintenance over time. The reduced maintenance and costs make it our go-to product when a client requests timber cladding. A timber cladding chosen frequently by architects, hardwoods such as Cedar and Larch produce a very aesthetically appealing finish and weather beautifully if left untreated. The weathering process can be quite fast for a lot of clients though, and due to the increased cost and maintenance requirements, we feel that Thermowood is superior and will always recommend it. We also use softwoods in a Shiplap profile when clients are looking for a timber clad aesthetic, but want to paint the timber once it’s in place. The reduced upfront cost and ease of painting make it an easy choice over Thermowood or hardwoods. It’s also possible to make your portable building look like it’s built from brick and block, achieving what a lot of clients would view as a more natural and traditional finish. As with brick structures, maintenance is essentially non-existent, but the upfront cost can be extreme to a lot of clients. The bespoke nature of most of our products also allows for essentially any cladding material available on the planet, whether we’ve used it before or not. Vinyl wrapping, stone cladding and Prodema are some examples of cladding we’ve used before, but if you have any specific requirements or external looks you’re trying to achieve, just get in touch.